Conor McGregor (pictured) has either transformed into a marketing master, or an entitled brat. Or both. The current UFC lightweight champion surprised everyone by crashing the end of Thursday’s UFC 223 media day inside Barclays Center in Brooklyn. It is believed McGregor was partaking in the UFC 223 festivities in support of SBG Ireland teammate Artem Lobov, who faces Alex Caceres in Saturday’s prelims. However, it’s clear McGregor is still scorching hot from UFC president Dana White’s announcement Wednesday that McGregor will be stripped of his lightweight title the second Khabib Nurmagomedov and Max Holloway take center stage to compete for the 155-pound crown in UFC 223’s featured attraction. 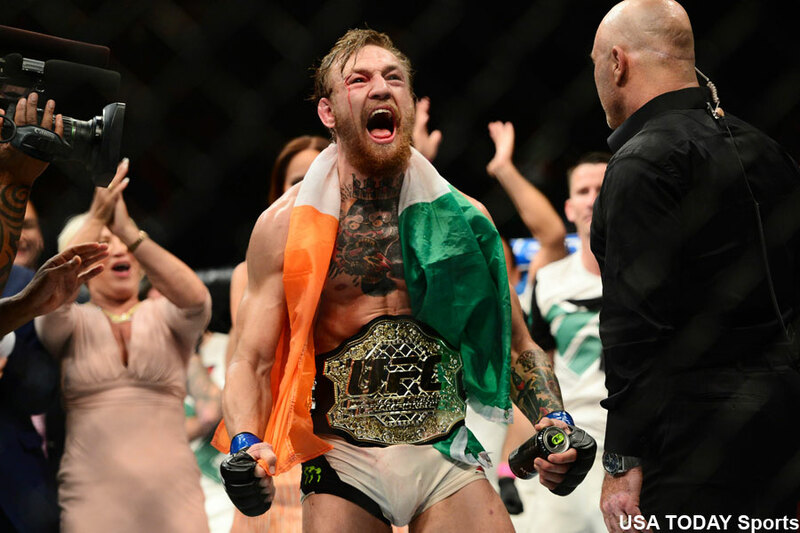 McGregor captured the lightweight throne by putting down Eddie Alvarez in November 2016, but has yet to defend his title. Much of his extended hiatus is due to August’s blockbuster boxing match with Floyd Mayweather Jr. where McGregor reportedly walked away with $100 million for the TKO loss. McGregor and his entourage rushed Barclays’ dock and tried to rush one of the buses that was transporting the UFC 223 fighters back to the hotel. It is believed McGregor thought Nurmagomedov was on that shuttle. McGregor and his crew went crazy and started throwing objects at the bus, smashing the windshield with either a chair or railing. Michael Chiesa, who was on the bus, suffered multiple cuts to his face from shards of flying glass. The lightweight is currently in the hospital and his bout against Anthony Pettis is now in jeopardy. Someone whose fight isn’t uncertain is Lobov. White has yanked him from UFC 223 because he says Lobov joined McGregor in the melee. White added that there is currently a warrant out for McGregor’s arrest and his private plane won’t be allowed to leave New York.